What to do with leftover turkey department. Heat broth to boiling and add chicken, garbanzos, pepper, rice, and oregano. Serve in large bowls and add cheese and avocado just before serving. Serves 4. Combine all ingredients and mix well. Add the greater amount of mayonnaise if it seems dry. If you have any fresh mushrooms on hand, slice them up and add them to the mix. Pour into a 1 1/2 quart casserole (spray with Pam, first). Top with corn flake crumbs. Bake at 375 degrees for 45 minutes until hot and bubbly. My father, who never has seconds, eats seconds of this. In medium saucepan, over medium heat, combine milk, flour, mustard, salt and pepper and cook 5 to 6 minutes or until sauce is thickened. Stir in cheese and cook until melted. Remove 1 cup cheese sauce and reserve. Add 1 can chilies to remaining sauce. In medium bowl combine turkey, black olives, remaining can of chilies and reserved cheese sauce. On each tortilla spread 1/4 cup turkey mixture and roll up. Place tortilla seam-side-down in (9-X 13-inch) baking dish, sprayed with vegetable cooking spray. Repeat with remaining tortillas. Pour remaining sauce over top of tortillas. Bake at 350 degrees F. 20 minutes or until hot and slightly bubbly. No real recipe, but saw this on a cooking show. Just fry up on the stove in some butter, a combination of turkey and dressing, serve on a sandwich roll topped with a dollop of gravy and cranberry sauce. I'm trying that this year - for a non-cook like myself, it's sounds cheap and easy. 1. Place turkey carcass , onions, half the celery, salt, pepper and thyme in a large pot. Immerse completely with water** bring to a boil. Reduce heat to low and simmer (covered) for 1 hour. 2. Take the carcass out of the pot and remove any meat still clinging from the bones (set aside with cube turkey). Place bones back in pot and continue cooking for 1 hour longer. 3. Strain broth and return to pot with remaining celery and carrots. Cook 20-30 minutes longer. 4. Stir in turkey meat and top with tortilla pieces. Simmer for 5 minutes longer. Serve soup with additional warm tortillas. My men took these sandwiches skiing with them this morning!! Don't forget the cranberry--that's what makes it great!! It's lovely leftover time! We've been enjoying pasta cooked with leftover turkey and vegetables. Also traditional in our house are sandwiches made with turkey, dressing, mustard and cranberry sauce! This recipe for cranberry turnovers looks great! I'm going to make some as soon as my puff pastry thaws! Okay, how about the week after? There was a package of smoked salmon and a wonderful head of golden cauliflower that I didn't have time to deal with during the holidays...they are about to become a wonderful meal for me and me only!! Yum! I love smoked salmon and cauliflower, but I've never had them together. What did you make from them, Lee? It's leftover time. Reheated turkey is usually a sad affair, and I don't care for the traditional turkey sandwich. Of course, I made turkey soup on Thursday night with the carcass and lots of veggies and herbs (I like to stud an onion with a couple of cloves). I like to strain it and just eat it plain with chopped parsley; it's heaven on a cold day. Tonight, I decided to make a turkey pot pie. So easy. Just shred the turkey. Sauté leeks, shallots, celery, carrots and mushrooms in butter and add some herbs. Make a sauce velouté (it's just a béchamel made with turkey stock instead of milk). Assemble and top with frozen puff pastry. I can't wait! I also had too much bread for stuffing, so I made a raspberry pecan bread pudding. I soaked the old bread cubes in milk, added eggs beaten with sugar and vanilla, cinnamon and allspice. Toss together, spread in a buttered dish and stud the top with chopped pecans and raspberries (they were on sale today--two for $3!). Of course, you must serve this with bourbon sauce! Yum! I'm taking the Pioneer Woman's suggestions and making Turkey Tetzrazini and Turkey Spring Rolls. That's the downside of being a guest. It helps to put some tupperware in your car and casually mention that you have it as the dinner concludes. Our cousin always used to send my dad and me home from Thanksgiving with enough leftovers for two dinners apiece. I had enough left over from my own patched-together Thanksgiving dinner for two more dinners. I'm planning to have turkey, stuffing, and gravy for supper this Friday. Well, my mom always gives out left overs. However, this year she gave them all to my sister-in-law's brother. He's not in the best place financially, so I think it made mom feel better to give him all the food, so she knows he's eaten. Friend, I'm assuming you bake the pudding after putting it in a buttered dish and before studding it with the pecans and raspberries. Correct me if I'm wrong because I'm getting ready to make this dish in the next day or two! Another thing I am making is scratch biscuits to serve with all the yummy lamb gravy I have. It's been decades since I've made biscuits! I can't remember the last time I had biscuits. They're good. No, I baked it after adding the pecans and raspberries. Good luck! I got some left-overs from Christmas, but I'm just reheating them and eating them as they were, no new fancy recreations. That is perfect, Chuck, although I don't think I'd call Shepherd's Pie, bread pudding, and soup fancy. More like comfort food, which I really need right now since the Polar Freeze has returned to Colorado. I just finished preparing 3 shepherd's pies, all except the mashed potato topping. I added broth to the remainder of the filling, and now I'm eating lamb soup. Speaking of MP, there's a heated debate raging over potato terminology on the Prairie Home Companion site. Should it be called mashed potatoes, or whipped? What is it in your neck of the woods? Inquiring minds want to know! The biscuit dough is chilling in the fridge. It turns out that this is the perfect time of year to make biscuits, because you have to keep the butter and milk cold. Why? You want the tiny beads of butter to be suspended within the flour, not melted. If the milk and butter are soft, it will be a gluey mess. The recipe is simplicity itself: 2 cups flour, 4 tsp. baking powder, 3/4 tsp. salt, 1/2 cup butter, and 1/3 to 1/2 cup milk. Sift the dry ingredients together, slice the cold butter and cut it into the dry ingredients with a pastry cutter until the dough resembles tiny peas. Sprinkle the milk over while tossing with a fork. Gather up the dough in a ball, work it briefly with your hands and put in the fridge to chill. Roll the dough out about 1/2 inch thick, cut into rounds with a biscuit cutter or jar lid, place on an ungreased cookie sheet and bake at 425 degrees F until golden brown. Makes 20. They will be so good with the lamb gravy! I'm hoping to persuade my Denver Brokie friends to get together with me. I know Offline Chuck particularly likes biscuits and gravy. Oh yeah, biscuits and gravy are good! They sound a lot like scones. Maybe they are the same, just different name. 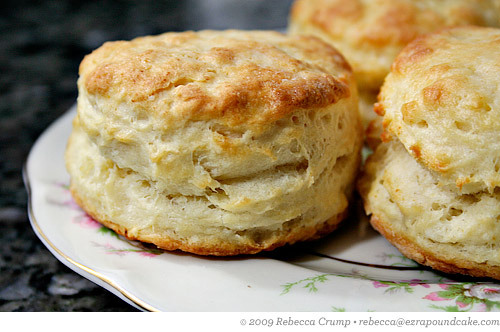 biscuits tend to be softer than scones. Ok, I see. I don't think I ever had a bisquit. I think it depends on who makes the scones, they can look very similar to biscuits. This is the scone that Americans see. 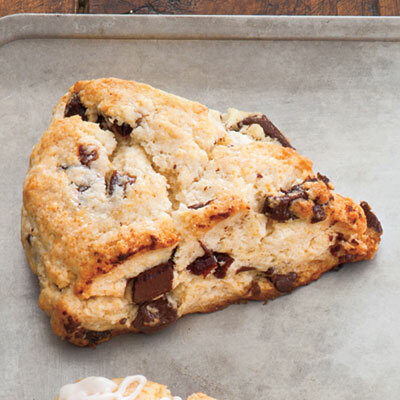 Our scones tend to be almost triagular, and often are not plain.....the pic above is a chocolate cherry scone. This is a plain scone, from the UK. This looks very similiar to our biscuits, which are below. the triangular scones first pictured above are served room temperature, usually. The biscuits just above are served warm, are light and flakey, and can be pulled apart easily. If they're light and flakey there's probably quite a lot of butter in them. The variety of scones we usually have here tends to be a bit dry, so probably not quite the same. They were very popular in the 70s, I don't actually think I've had them since then. The were always plain, no such thing as chocolate or cherries in the dough. Take a bowl of hot turkey broth with the flavorings of your choice and add a couple of spoonfuls of creamed corn. Voila...instant chowder! Also works with creamed peas, celery or green beans. I don't do anything unique with the leftovers, I just reheat and eat. Me too. It's nice to just poke buttons on the microwave then watch TV with the ever hopeful whippet. Paul, I will have to add that to my repertoire! Thanks!